- The Indonesian Alphabet Award is issued to Radio Amateurs/SWL worldwide that can prove to have made 2-way radio contacts / heard in Amateur HF bands with stations of Radio Amateurs situated on the Indonesian territory. - Collect 26 stations working from Indonesia by the first letter of their callsign from A to Z. In the application, QSOs must be specify in alphabetical order by the first letter of the suffix. - All QSOs must be done on or after July 9, 1968. - Applicants must have made the QSOs /HRDs from same DXCC Entity. - Domestic and foreign operators operating portable such as YB8RW/3 or YB8/DL3KZA are also valid. - The QSL cards are not required, but they must be in possession of the applicant and must be produced upon request for inspection. (by scan and sending via e-mail). - Claim must be accompanied by QSL card list (GCR) furnished with the call signs of stations worked, dates, times, bands, modes. Alternatively a list of stations worked with a copy of the QSL cards can be used as well. Applicants may attach the list and scans of the QSL cards. 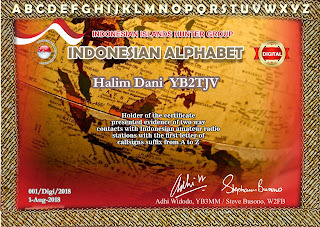 - eQSL, LoTW, Clublog and other electronic confirmation can be used. Please click on the following link for a copy of the application form.